The Smithsonian’s National Museum of the American Indian in Lower Manhattan, the George Gustav Heye (pronounced “high”) Center, opened in 1994 in the historic Alexander Hamilton U.S. Custom House, one of the most splendid Beaux-Arts buildings in New York. The museum features year-round exhibitions, dance and music performances, children’s workshops, family and school programs and film screenings that present the diversity of the Native peoples of the Americas and the strength of their cultures from the earliest times to the present. The museum is a branch of the Smithsonian’s National Museum of the American Indian located on the National Mall in Washington, D.C. The National Museum of the American Indian was established by Congress in 1989. The Heye Center in New York opened in 1994; the Cultural Resources Center, six miles from the National Mall building in Suitland, Maryland, opened in 1999; and the National Museum of the American Indian opened in September 2004. The museum’s permanent exhibition “Infinity of Nations: Art and History from the Collections of the National Museum of the American Indian” showcases some 700 objects from Native North, Central and South America. Objects include an exquisite Olmec jade head, a rare Anishinaabe man’s outfit and a remarkable Charles and Isabelle Edenshaw (Haida) spruce root hat. This unparalleled assemblage of American Indian cultural material represents the tremendous breadth of the collections and the richness of Native art. Completed in May 2018, the newest addition to the museum is the imagiNATIONS Activity Center. The critically acclaimed space is a lively, interactive place where young visitors explore the academic principles behind Native ideas so ingenious they continue to affect modern-day life and scientific disciplines. Visitors leave with a key takeaway—Native people are the original innovators of the Americas. In addition, the museum hosts a selection of changing exhibitions that present and reaffirm the Native voice. The schedule includes exhibitions developed by the museum from its collections, installations of contemporary Native art and significant traveling exhibitions from other institutions. The museum hosts Native musicians, dancers, artists and elders in presentations of their art and cultural heritage and in informal programs that invite them to share directly with museum visitors the life ways and worldviews of Native peoples. Programs include dance presentations, hands-on workshops, storytelling programs and annual events, including the Children’s Festival and the Native Sounds Downtown concert series. The Film and Video Center of the National Museum of the American Indian is dedicated to presenting the works of Native Americans in media. An international leader in the support and presentation of indigenous film and video projects, the Heye Center hosts the Native Cinema Showcase, an annual presentation of films held at the Santa Fe Indian Market in New Mexico. Screenings and discussions with filmmakers are also periodically held in the museum’s auditorium. For more than 20 years, the Museum Store has served as New York City’s premier destination to purchase authentic Native American merchandise. Recently expanded, the store now features more items from a wider representation of Native groups than ever before, offering apparel, art, literature, jewelry, food and more for all ages. The site of the Museum Store historically served as the Cashier’s Office of the Alexander Hamilton U.S. Custom House. The renovation of the space preserves original details like antique metal dividers for the cashier’s cages and design flourishes, such as intricate crown molding, grand chandeliers and even the original vault used by the cashiers. The Heye Center has a staff of approximately 60 employees. 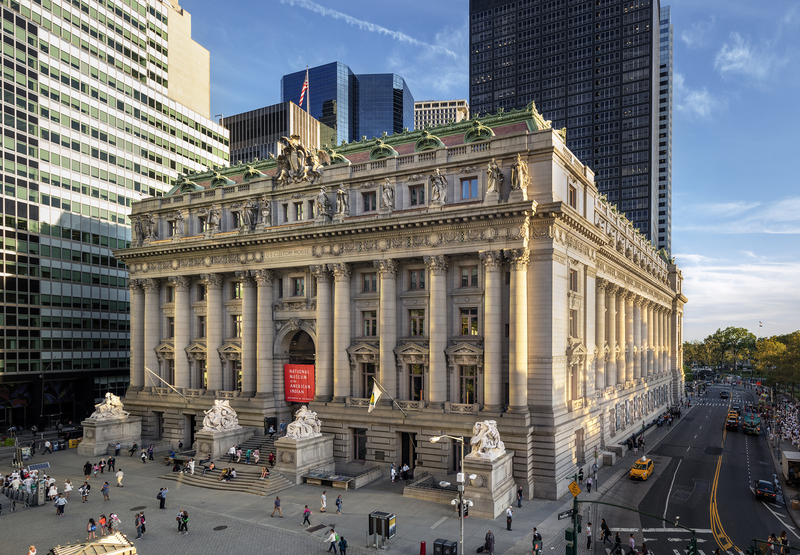 Located at One Bowling Green, across from Battery Park, the George Gustav Heye Center is free and open from 10 a.m. to 5 p.m. daily, Thursdays until 8 p.m. By subway, the museum may be reached by the 1 to South Ferry, the J or Z to Broad Street, the 4 or 5 to Bowling Green or the R or W (on weekdays) to Whitehall Street. For general information, visitors may call (212) 514-3700 or visit the museum’s website at AmericanIndian.SI.edu. The National Museum of the American Indian George Gustav Heye Center in New York City.